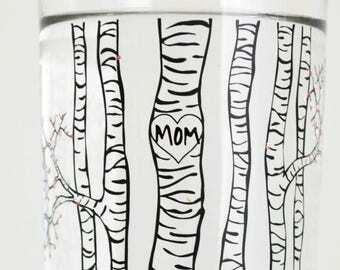 The perfect gift for mom, or anyone special in your life. 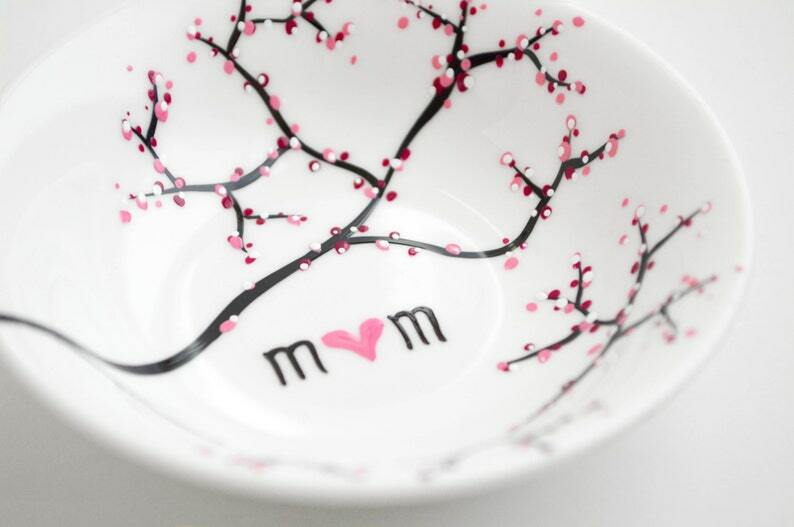 This darling porcelain jewelry dish is hand painted with my signature Spring Cherry Blossom design. Pink and white blossoms jewel delicate tree branches that extend across the entire bowl. 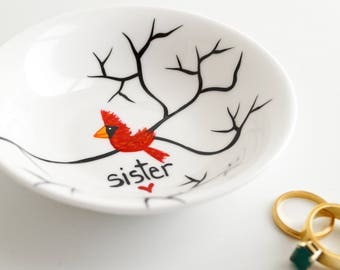 This sweet little bowl is a wonderful keepsake to store your pretties. 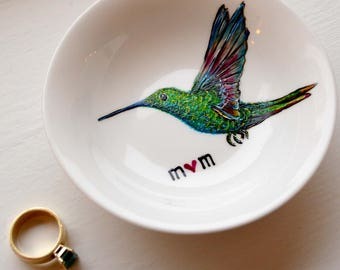 This jewelry dish is the ideal gift for Mother's Day, Baby Showers and Birthdays. Show how much she means to you with the gift of an original work of art. 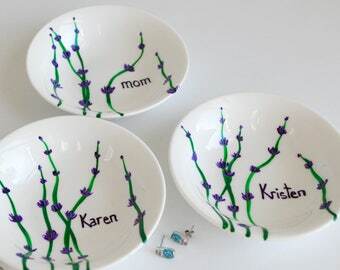 I hand-paint each dish made-to-order with love and attention to every little detail. 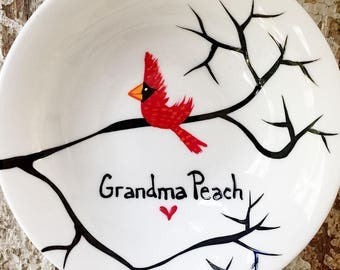 I'm happy to personalize this dish with a name or date instead of "mom". Please just type out the personalizations to be added in the "note to seller" section on Etsy when you checkout. • More dishes are available. Contact me for multiple sets. Make sure to follow me on Instagram or Facebook for private, exclusive sales, and be among the first to see new paintings, pottery, and glassware creations. Sign up for my newsletter to keep up with private sales. This was a gift, Mum loved it! Beautiful! I can't wait to give this to my mom for Mother's Day! I've been following your Etsy page for years, but never have taken the leap to buy anything. Now that I have, I know I'll be buying more things from you soon! 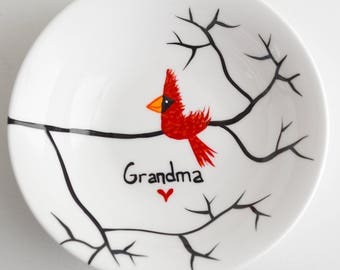 This is a beautiful bowl, and I know my mom is going to love it! Thanks so much!! It came quickly and “Oma” loved it. Thank you! Payment is due at the time of purchase. If paying by e-check, shipments will not be shipped until the e-check clears. In the case of non-payment I will cancel the sale. I do not include printed receipts with any of my packages. The receipt is kept electronically online and can be accessed from your own computer whenever you wish. I want you to be happy with your artistic creations. If you are not satisfied with your purchase please contact me within 7 days of receiving it. I will refund your money upon return of the item in its original condition. I will pay for return shipping. Sometimes accidents happen and in the rare case that your item arrives cracked or damaged--not to fear! 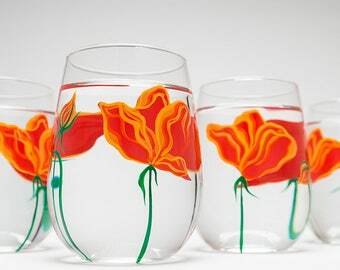 I will send a free replacement, all shipping costs on me, so don't be shy about buying glass and ceramics. I ship to the address on file with Etsy. Please confirm your address at the time of check out. I am happy to ship items as gifts. I'm not able to gift wrap orders because I have to encase the glasses in protective packaging to ensure they arrive safely. I package with bubble wrap, packing peanuts, tissue paper and eco-friendly crinkle paper that's 100% biodegradable. I'm happy to include a gift-card with your personal message. Simply let me know what you'd like the card to read in the "note to seller" section when you checkout. I ship all orders Priority mail via USPS unless otherwise arranged. Tracking notices are emailed when the package ships so you can track your package online. If you are in a rush please make me aware of your timeline when your order is placed. If you have ordered a custom piece that is being made specifically for you, please allow at least 2-3 weeks for production. More time may be needed depending on the season and your order. Please message me for details on production times. I'm happy to hear from you and usually response quickly. • International shipments are shipped USPS Priority International. All customs duty fees and taxes are the responsibility of the buyer. Customs duties, taxes, VAT, brokerage fees, or tariffs could be applied to your package at the discretion of your local customs officers or post office. I do not have any control over customs and the packages they randomly inspect, and packages I ship are no more likely to be inspected than any other package. • I do not mark international orders as "gift", and I do not undervalue the contents of the package on the customs form as that is against the law and I could face heavy fines up to $10,000. Please do not ask me to break the law. 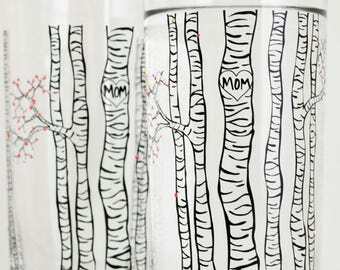 My designs are copyrighted with US Copyright Office. © Mary Elizabeth Arts L.L.C. The sale of any of my prints, original paintings or painted designs does not transfer copyright or any reproduction rights. If you wish to display publicly, contact me for permission and details. If you wish to use any of my photographs, please contact me for permission. With every image used, credit must be given as well as a link back to my shop. I report Trademark and Copyright Infringement. It is illegal to copy my work, photos or descriptions or ask another artist to do so. Thank you for respecting my hard work and designs.